Welcome to the Official Apple Valley Homepage! 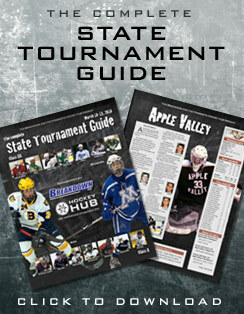 The 2009-2010 hopes to be a season that builds on last years' return to the section finals. Hoping to erase the unfinished business of last years' overtime loss will serve as fuel for Senior Captains Peter Sikich and Adam Robson. Also returning and hoping to take the next step include Senior Chris Fischer, Junior All-Conference goaltender Aaron Gretz and Sophomores A.J. Michaelson and Derek Smith. Adding to the mix will be a group of sophomores that competed at the Bantam A state tournament last season. Overall, it looks to be a promising season in the Valley.